Lots of folks buy a data system, get it all installed, and then use it as a fancy lap timer or just for the shift lights. With a little bit of dedication and some diligence, you can get much more out of your data system and actually use it to improve your driving, build reference material, and do preventative maintenance! ​The first rule to follow is to always turn on your data system and make sure it’s recording. Every. Single. Time. This means you should probably wire it to a 12v switched power circuit in your car, so that when the ignition is turned on, the data is on. This really helps to take the memory factor out of turning the system on. This also ensures that when you unknowingly turn your best lap, you have data to look back at to see how you did it! 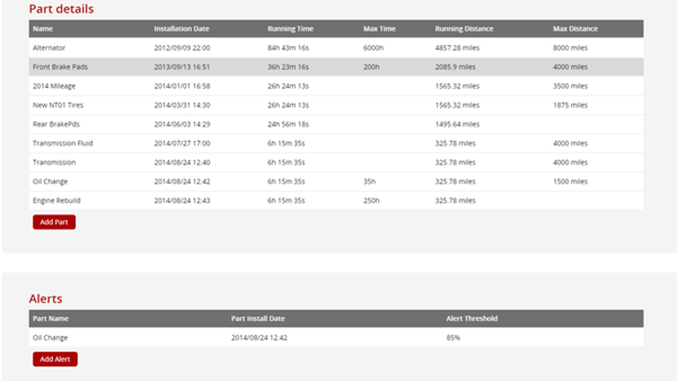 Next, make sure you have the track info loaded for where you are driving. For many systems, that is just keeping the GPS start/finish coordinates in the unit, but for some systems, you’ll need to load a specific file for each track. If your system has enough memory (which most do), I recommend leaving in all the tracks you visit. This is another great way to make sure you don’t get out on the track and have useless data. Some systems, like AiM, allow you to recover data without a start/finish coordinate by adding in the start/finish line after the session. Third, keep good notes with your data. Most systems allow you to either put notes in or attach a separate file. By putting in things like the weather, track temp, condition of the tires, air pressures, etc. you’ll be able to review the data and know some of the causes of a good or bad performance. Also include notes about your personal preparation and mental states to see if you can determine what works best for your own performance and driving. A great way to make this quicker is to keep a simple template in your word processor that you can then cut and paste into the data system and fill in with the relevant data. Another important thing to do when using data is to review it after every session. This review doesn’t have to be a big, deep data review, but rather a quick glance to make sure things are okay with your car. Take a look at the battery voltage to see if it’s staying consistent and where it’s supposed to be. Take a look at the engine temperature and see if it’s stable or running away for a meltdown. Same thing with oil pressure. Check the lowest values during laps to see if it’s starving for oil in the corners, something many cars will do with a simple upgrade to stickier tires. Also review your data for driver improvements. This could be an article in itself (and will be! ), but take a look to see if you’re braking well, cornering at the limit in each corner, and making a smooth progression to full throttle on corner exit. After looking at these things, make a simple plan of attack for the next session with three or fewer things to work on. This is the quickest way to improve your driving by using your data system. Another good data practice is to leverage your data to make better car maintenance choices. Almost all data systems will give you the number of hours and miles that you covered in a session. You can then enter this info in a spreadsheet to track how many hours you have on an oil change, how many miles on wear items like ball joints, or how long until you need to repack your CV joints. This process can be automated and made much easier if you use a service like www.racecartracking.com which allows you to enter parts and limits and will then warn you when they get close to needing to be replaced. Finally, always remember to back up your track data. Having a historical database of info to look back on is invaluable. The data you collect can help you go back and review your best laps, help determine car setup, and let you track when problems started to occur. Being able to review things, like when oil pressure started to run a little lower, when temps ran a little higher, or when voltages started to drop, can lead you to a quicker fix or a determination of what might be causing that problem. Most important with the data backup is to be able to review your past performances. Maybe you have an event where you are off the pace and a quick look back at old data tells you where your speeds are down, a corner where you’re not building as much lateral G, or a brake zone you’re having trouble with. Without the historical reference data, you are learning the track all over again. These simple things can make a major difference in your data practices and ability to replicate previous performances. Whether it’s being able to get back down to your best lap time, mastering a corner that you’ve had trouble with, or catching a maintenance problem before it costs you track time, you’ll be happy after you start implementing them. Clck here to shop for data acquisition systems in the Winding Road Racing store.